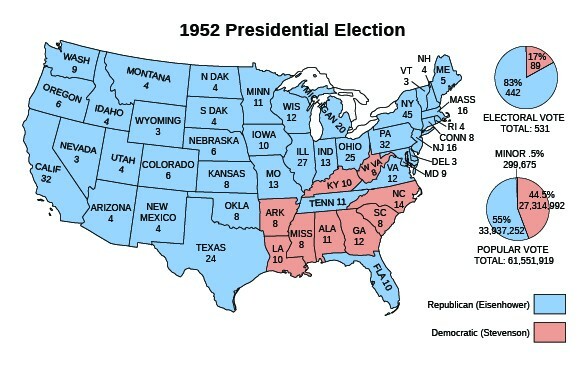 After Harry Truman declined to run again for the presidency, the election of 1952 emerged as a contest between the Democratic nominee, Illinois governor Adlai Stevenson, and Republican Dwight D. Eisenhower, who had directed American forces in Europe during World War II. Eisenhower campaigned largely on a promise to end the war in Korea, a conflict the public had grown weary of fighting. He also vowed to fight Communism both at home and abroad, a commitment he demonstrated by choosing as his running mate Richard M. Nixon, a congressman who had made a name for himself by pursuing Communists, notably former State Department employee and suspected Soviet agent Alger Hiss. In 1952, Eisenhower supporters enthusiastically proclaimed “We Like Ike,” and Eisenhower defeated Stevenson by winning 54 percent of the popular vote and 87 percent of the electoral vote. 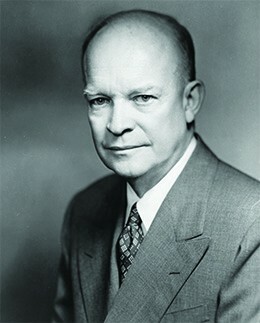 When he assumed office in 1953, Eisenhower employed a leadership style he had developed during his years of military service. He was calm and willing to delegate authority regarding domestic affairs to his cabinet members, allowing him to focus his own efforts on foreign policy. Unlike many earlier presidents, such as Harry Truman, Eisenhower was largely nonpartisan and consistently sought a middle ground between liberalism and conservatism. He strove to balance the federal budget, which appealed to conservative Republicans, but retained much of the New Deal and even expanded Social Security. He maintained high levels of defense spending but, in his farewell speech in 1961, warned about the growth of the military-industrial complex, the matrix of relationships between officials in the Department of Defense and executives in the defense industry who all benefited from increases in defense spending. He disliked the tactics of Joseph McCarthy but did not oppose him directly, preferring to remain above the fray. He saw himself as a leader called upon to do his best for his country, not as a politician engaged in a contest for advantage over rivals. However, the United States often feared that the Soviets were making greater strides in developing technology with potential military applications. 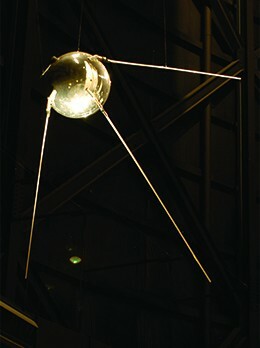 This was especially true following the Soviet Union’s launch of Sputnik, the first manmade satellite, in October 1957. In September 1958, Congress passed the National Defense Education Act, which pumped over $775 million into educational programs over four years, especially those programs that focused on math and science. Congressional appropriations to the National Science Foundation also increased by $100 million in a single year, from $34 million in 1958 to $134 million in 1959. One consequence of this increased funding was the growth of science and engineering programs at American universities. Levitt’s houses cost only $8,000 and could be bought with little or no down payment. The first day they were offered for sale, more than one thousand were purchased. Levitt went on to build similar developments, also called Levittown, in New Jersey and Pennsylvania. As developers around the country rushed to emulate him, the name Levittown became synonymous with suburban tract housing, in which entire neighborhoods were built to either a single plan or a mere handful of designs. The houses were so similar that workers told of coming home late at night and walking into the wrong one. Levittown homes were similar in other ways as well; most were owned by white families. Levitt used restrictive language in his agreements with potential homeowners to ensure that only whites would live in his communities. 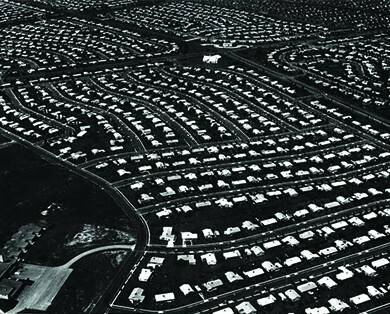 This aerial view of Levittown, Pennsylvania, reveals acres of standardized homes. The roads were curved to prevent cars from speeding through the residential community that was home to many young families. In the decade between 1950 and 1960, the suburbs grew by 46 percent. The transition from urban to suburban life exerted profound effects on both the economy and society. For example, fifteen of the largest U.S. cities saw their tax bases shrink significantly in the postwar period, and the apportionment of seats in the House of Representatives shifted to the suburbs and away from urban areas. The development of the suburbs also increased reliance on the automobile for transportation. Suburban men drove to work in nearby cities or, when possible, were driven to commuter rail stations by their wives. In the early years of suburban development, before schools, parks, and supermarkets were built, access to an automobile was crucial, and the pressure on families to purchase a second one was strong. As families rushed to purchase them, the annual production of passenger cars leaped from 2.2 million to 8 million between 1946 and 1955, and by 1960, about 20 percent of suburban families owned two cars. The growing number of cars on the road changed consumption patterns, and drive-in and drive-through convenience stores, restaurants, and movie theaters began to dot the landscape. The first McDonalds opened in San Bernardino, California, in 1954 to cater to drivers in a hurry. 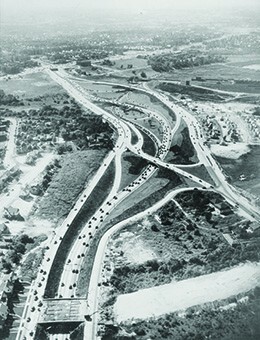 In the late 1940s, a network of newly constructed highways connected suburban Long Island with Manhattan. The nation’s new road network also served a military purpose; interstate highways made it easier to deploy troops in the event of a national emergency. As drivers jammed highways and small streets in record numbers, cities and states rushed to build additional roadways and ease congestion. To help finance these massive construction efforts, states began taxing gasoline, and the federal government provided hundreds of thousands of dollars for the construction of the interstate highway system. The resulting construction projects, designed to make it easier for suburbanites to commute to and from cities, often destroyed urban working-class neighborhoods. Increased funding for highway construction also left less money for public transportation, making it impossible for those who could not afford automobiles to live in the suburbs. As the government poured money into the defense industry and into universities that conducted research for the government, the economy boomed. The construction and automobile industries employed thousands, as did the industries they relied upon: steel, oil and gasoline refining, rubber, and lumber. As people moved into new homes, their purchases of appliances, carpeting, furniture, and home decorations spurred growth in other industries. The building of miles of roads also employed thousands. Unemployment was low, and wages for members of both the working and middle classes were high. Following World War II, the majority of white Americans were members of the middle class, based on such criteria as education, income, and home ownership. Even most blue-collar families could afford such elements of a middle-class lifestyle as new cars, suburban homes, and regular vacations. Most African Americans, however, were not members of the middle class. In 1950, the median income for white families was $20,656, whereas for black families it was $11,203. By 1960, when the average white family earned $28,485 a year, blacks still lagged behind at $15,786; nevertheless, this represented a more than 40 percent increase in African American income in the space of a decade.